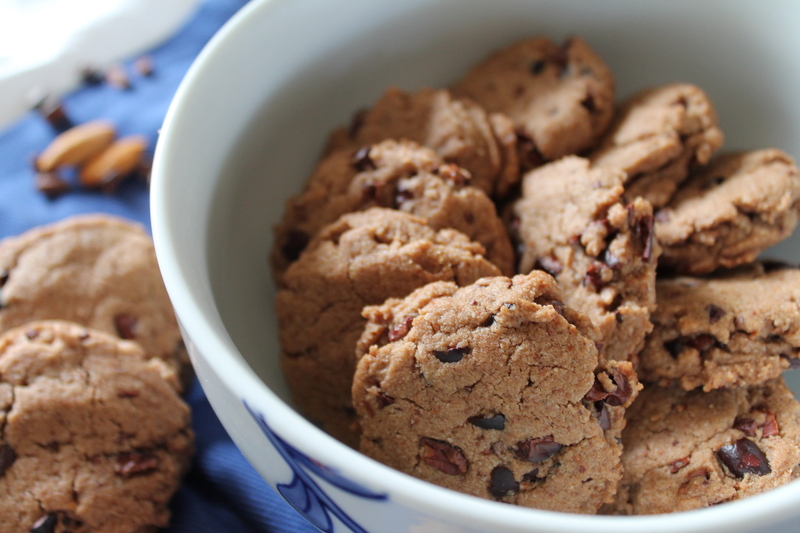 And the best part is, you make them entirely in the food processor! Just throw everything in and blitz until it clumps together. You will need almond meal (I like the Trader Joe’s brand because it is unblanched and just slightly coarser ground, but any almond meal will do! 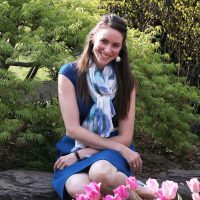 ), cocoa or cacao powder (the difference being that cacao powder is raw, and therefore less processed), and salt to start. Follow this with a drizzle of honey, some shortening or coconut oil (I use Spectrum palm shortening, which is harvested responsibly and has zero flavor; I find that coconut oil, while arguably healthier than palm oil, has a distinct flavor, and also causes more spread, which makes the edges of the cookies dry out slightly), and a ton of vanilla. 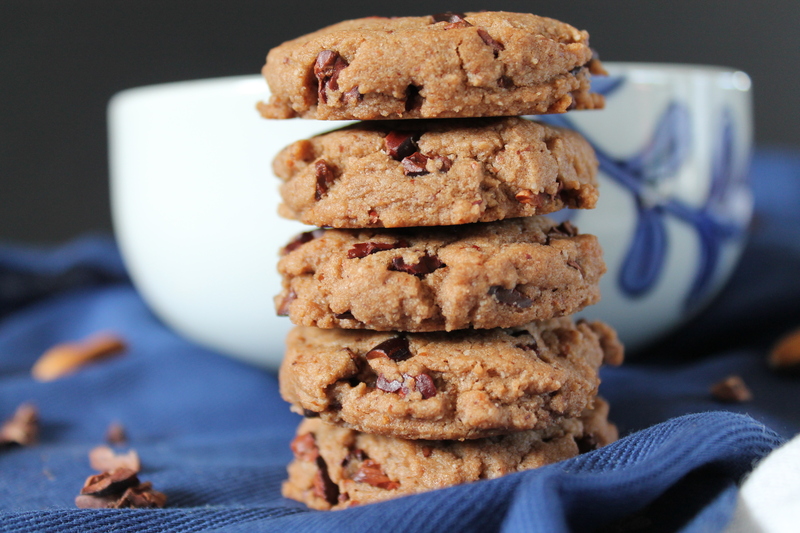 Vanilla is such a classic cookie flavor; you really can’t make great cookies without it! 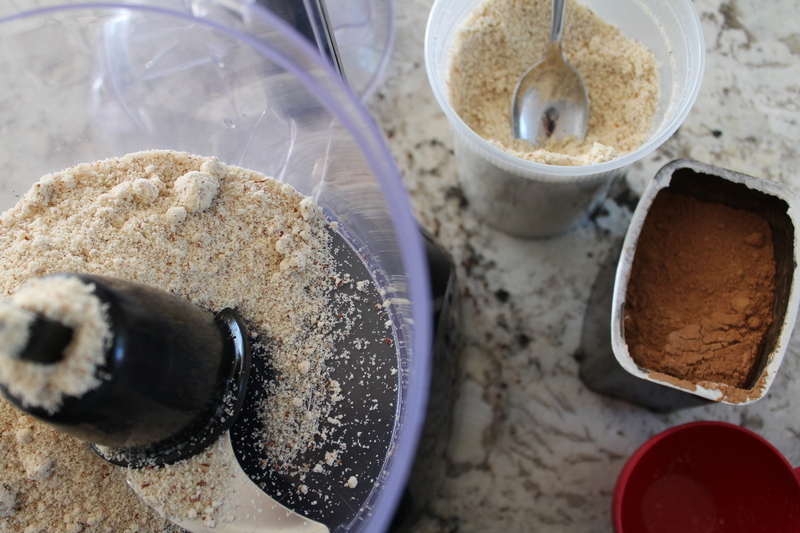 When the mixture is even in color and texture, dump in some cacao nibs! 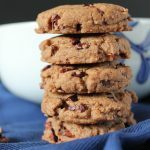 Okay, you can also use mini chocolate chips if you aren’t staying away from refined sugar, but I love cacao nibs for the crunch and the hit of dark chocolate flavor. 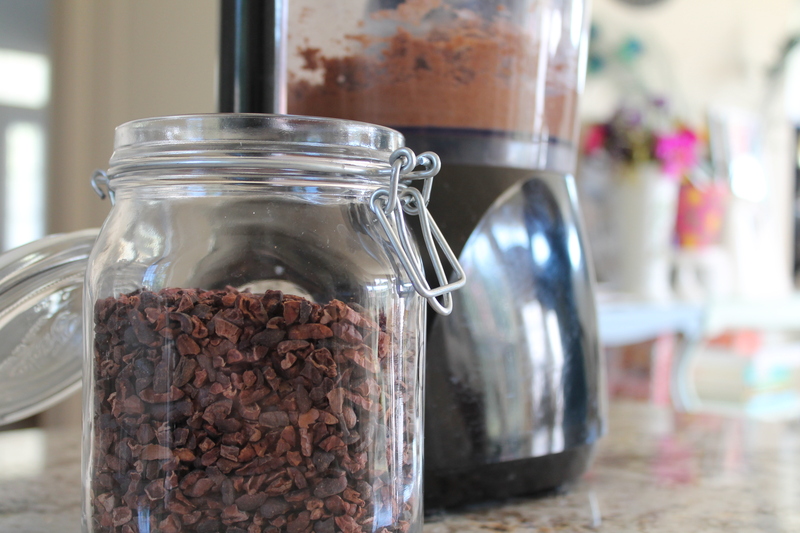 Cacao nibs are practically an unrefined ingredient, and they are full of fiber, iron, and antioxidants! 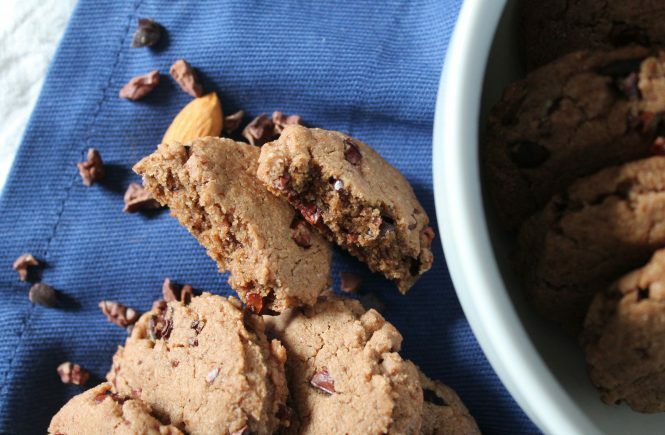 They are good for you, and they are delicious in these shortbread bites. 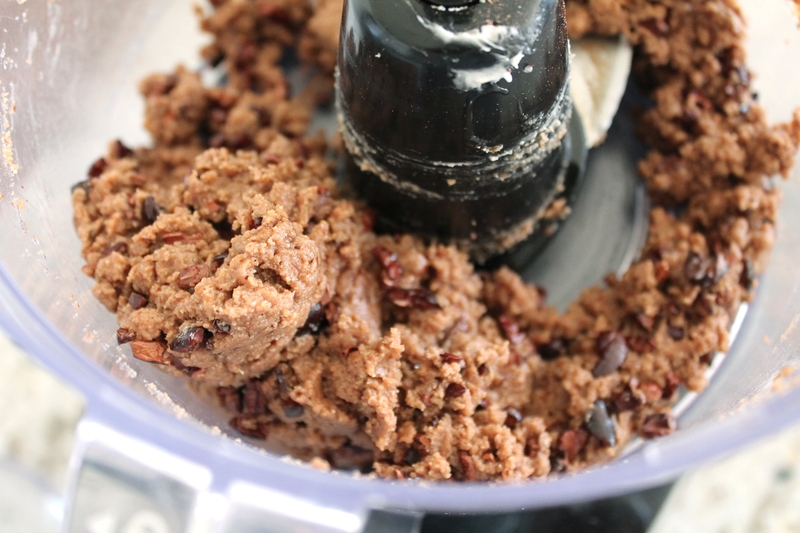 Pulse to work the cacao nibs through the dough. Scoop the dough by teaspoons out onto a lined cookie sheet. They won’t spread much, so you can fit all of them (usually around 2 dozen) on a single half-sheet. Press the tops lightly to flatten them into discs. Bake for 7 minutes at 350°. Let them sit for 5-10 minutes before moving, to help them set. Wham, bam, done. Cookies in only 15 minutes! When they come out of the oven, the outsides will be crisp and the insides will be moist, which makes a perfectly chewy little cookie! Over time, that inside moisture will creep to the edges of the cookie. I usually freeze mine, which helps a little with the self-control, and also helps them to keep a bit more chewy and satisfying. 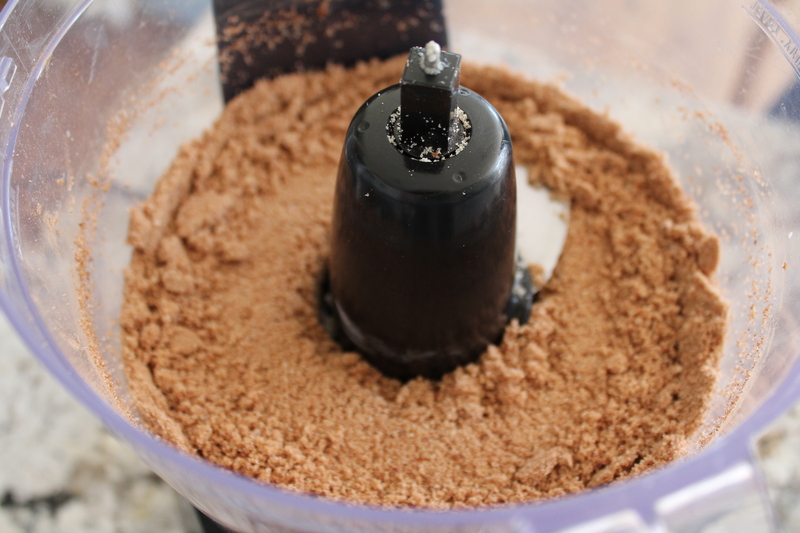 Blitz the almond meal, cocoa powder, baking soda, and sea salt in a food processor for 20 seconds, or until the cocoa powder has worked all the way through the almond meal. Add the shortening, honey, and vanilla and process until combined. Add the cacao nibs and pulse to combine. Scoop by teaspoons onto a Silpat- or parchment-lined cookie sheet. Press the tops slightly to flatten into discs. Bake for 7-8 minutes, until the outsides appear dry. 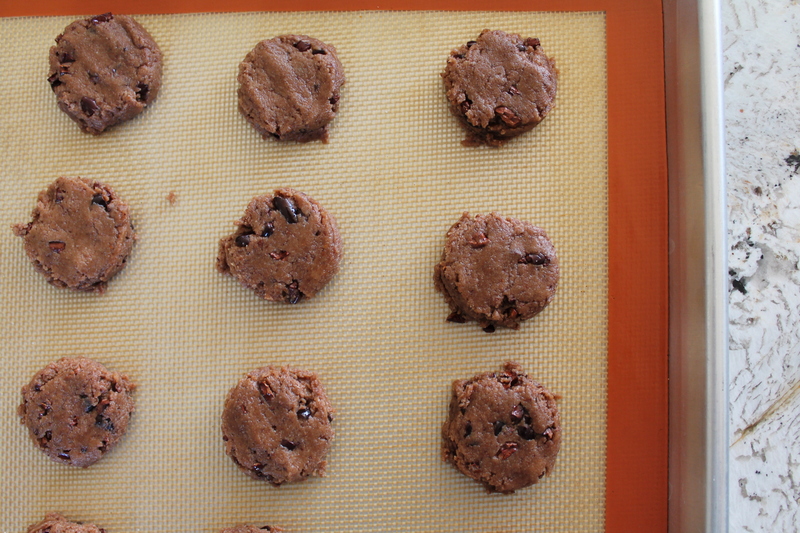 Allow to set on the cookie sheet for 5-10 minutes before moving to a cooling rack. Store in an airtight container in the freezer for up to 1 month.